I purchased 110 pewter frames surrounded with pink heart stones for favors for my daughter's baby shower. Excellent packaging, not one was broken or had a jewel stone missing. They were adorable better than I expected. Very pleased with the quality and service. Shipping was right on time too. I was pleased with the items I ordered and the cost was good. They delivered it quickly. The products I ordered are for Christmas presents. They will make very nice additions to any home. Best price by far out of several internet sources. Reasonable postage and handling charges. Did not use customer service. The stepping stones are beautiful. Ordered for myself and also as a little gift. Colors are really nice. Can't beat the price either. Excellent purchase. I'm a small seasonal business, so ordering from Koehler has been wonderful. I can order only what I need and the amount that I can sell. They have been very good with new merchandise available. Thanks from the small businesses!! I have a brand new home and I love the products that Koehlers has for Home Decor. I have purchased many products and when you are trying to decorate a new home it can be very expensive and Koehlers makes it so easy to buy beautiful products at excellent prices. This is my favorite site when I am looking for great deals on Home Decor. I bought several birdhouses. The prices for these are so unbelievable, I thought it was some kind of gimmick, that I might have to build them myself - like a kit. They arrived, fully made, AND gorgeous. Unbelievable. I am amazed at the detail and how you can possibly sell these at such a low price. I have seen plain box-type birdhouses, with a hole in the center, for three times this amount at a few stores that are common and known to be inexpensive. I will shop from Koehler anytime, and plan on buying gifts there too. Thank you! Great product and very pleased with it. Merchant took great care in shipping. Will do business with Koehler again. Very pleased with the prices. It's hard to find anything reasonable priced anymore. Ebay has become a joke with pricing 5 times what these people are paying for the items. It's was a very pleasant surprise to see items I could afford to purchase. Thank you for not putting 5 prices on your items. Very friendly staff and a CUSTOMER SERVICE DEPARTMENT THAT IS BY FAR THE BEST THAT I HAVE DEALT WITH!!!!!! No they don’t pay me!!!!! Having dealt with them as a retailer I was treated as well as I would treat my own customers who are the reason I am in business!!! You have proven to me that CUSTOMER SERVICE is #1 with you company!!!! I look forward to a long lasting relationship with Koehler Home Decor and I think you will be surprised if you give them the chance to prove themselves also. Thank you Koehler!!!! My experience with Koehler was outstanding. Their prices were far below other merchants for the same items. I am very pleased and will definitely purchase from them in the future. I now have their websites as one of my favorites and I will definitely recommend them to others. This is my second order from Koehler. The items I received on 9-13-07 I’m very pleased with. Koehler’s has many items that you cannot find anywhere else and the prices are super. I will continue to order from Koehler’s. Thank you. Making my purchase was fast and easy. Everything arrived well wrapped and boxed carefully. The quality of the products received was well beyond my expectations. I recently purchased a comforter for my daughter. I needed it within 2 days because she was leaving for college. I was extremely pleased with the overall customer service, quality of the product and delivery of the item. I called to see if the item was available and if they offered express shipping. The woman I spoke with said she had the comforter in stock and guaranteed I would have it within 2 days. She was more than helpful and the comforter arrived a day early. I received e-mail confirmations regarding my order and shipping. I was very pleased and would do business with them again. This was my first time purchasing something, and the overall experience was great. I have recommended this company to all my friends. Thanks Koehler keep up the great work! This was the first purchase I made from Koehler Home Decor, and I will purchase from them again. The quality of the merchandise that I purchased was very good, especially for the price. I enjoy the selection available to me. The communication that I received in regard to my order was good as well. Received my tabletop fountain this afternoon. Much larger than I expected. Very satisfied with it so far. I have it up and running already. I want to thank Koehler personally for helping me through this order. This was my first order through the Internet and it gave me confidence to continue this method. Thanks a million. I am very pleased with the quality of the merchandise I purchased. I would shop here again! I received my purchases yesterday, I love them. Koehler Home Decor has a new shopper and I have already shared the info w/my friends. Great products. Will continue doing business with them! I ordered two items--the green battery operated chimes fountain and the portable tool kit. Delivery was fast, and the items are exactly as pictured. I will definitely be ordering from Koehler again, and recommend them! 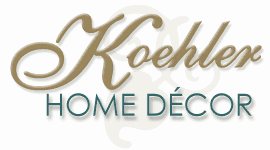 I am very happy with the products and service I have received from Koehler Home Decor. Both their prices and customer service go unmatched. I am amazed at their prices and appreciate their customer service (which seems to be non-existent with many online companies). This gift was delivered even faster than we had thought it would be! Thank you! And it seems that the packing of the gift for shipping was extremely well done. Again, thank you! My first order contained great products, excellent shipping time, and was packed very carefully. The wall decoration ordered was better than I expected. I will be ordering from Koehler for many of my clients needs. I have had an excellent shopping experience with Koehler Home Decor. I appreciate the fast shipment of my orders. I will definitely continue to order from them in the future. Keep up the great service! Great Selection, Great Prices, Very Effecient, My Newest and Favorite Web Site. I am so completely impressed with the online experience I had that Koehler Home Decor should offer training courses to all other online merchants to demonstrate how things are supposed to be done. I received my order within 24 hours even though I only expected ground. One of the glass items I ordered was damaged and they sent a replacement right away. A wide range of products An easy order process Speedy delivery OUTSTANDING customer service. One of the challenges of making online purchases is not knowing which vendor to select and not get ripped off. This merchant should be given some sort of classification to show how safe it is for first time online shopping. Thank you. GREATEST WHOLESALER YET! I just love it that you can buy from Koehler, and your order is shipped out almost immediately. There has been other wholesalers, I have been to and you never know if you will receive your order in a month, or six months. Then to top it off you might receive notification that they are out of something after a month. Another thing I love about Koehler, you don’t have to send in payment ahead of receiving order, and may pay immediately on the internet. I will continue to come back with all of this said. I have no quirks what so ever right now, and hope it continues this way. Its GREAT! THANKS!